The B83 thermonuclear weapon is a variable-yield unguided bomb developed by the United States in the late 1970s, entering service in 1983. With a maximum yield of 1.2 megatonnes of TNT (5.0 PJ, 80 times the 15 kt yield of the atomic bomb "Little Boy" dropped on Hiroshima on 6 August 1945), it is the most powerful nuclear free-fall weapon currently in the United States arsenal. It was designed at Lawrence Livermore National Laboratory, and the first underground test detonation of the production B83 took place on 15 December 1984 in Nevada at Area U19ac. The B83 nuclear components have been attributed as the same as the earlier B77. The B83 replaced several earlier weapons, including the B28, B43, and to some extent the ultra-high-yield B53. 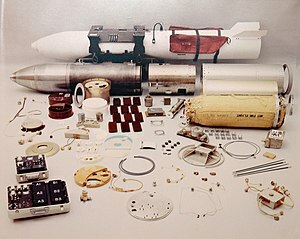 It was the first U.S. nuclear weapon designed from the start to avoid accidental detonation, with the use of "insensitive explosives" in the trigger lens system. Its layout is similar to that of the smaller B61, with the warhead mounted in the forward part of the weapon to make the bomb nose-heavy. It was intended for high-speed carriage (up to Mach 2.0) and delivery at high or low altitude. For the latter role, it is equipped with a parachute retardation system, with a 14-meter (46 ft) Kevlar ribbon parachute capable of rapid deceleration. It can be employed in free-fall, retarded, contact, and laydown modes, for air-burst or ground-burst detonation. Security features include next-generation permissive action link (PAL) and a command disablement system (CDS), rendering the weapon tactically useless without a nuclear yield. The B83 was reportedly[by whom?] test fired in the Grenadier Tierra nuclear weapon test on 15 December 1984, at a reduced yield of 80 kilotonnes due to the Threshold Test Ban Treaty. With the dismantling of the last B53 bomb in 2011, the B83 became the highest yield nuclear weapon in the U.S. arsenal. About 650 B83s were built, and the weapon remains in service as part of the United States "Enduring Stockpile". Nuclear capability has been removed from the B-1B, although it was tested with the B61 nuclear bomb in the mid-1980s, as well as with the ACM, Advanced Cruise Missile (now being retired). The B83 is one of the weapons considered for use in the "Nuclear Bunker Buster" project, which for a time was known as the Robust Nuclear Earth Penetrator, or RNEP. While most efforts have focused on the smaller B61-11 nuclear bomb, Los Alamos National Laboratory was also analyzing the use of the B83 in this role. The physics package contained within the B83 has been studied for use in asteroid impact avoidance strategies against any seriously threatening near earth asteroids. Six such warheads, configured for the maximum 1.2 Mt yield, would be deployed by maneuvering space vehicles to "knock" an asteroid off course, should it pose a risk to the Earth. In the 1996 film Broken Arrow, two B83 bombs are stolen. In the strategy game World in Conflict, a B83 is considered the last resort if the U.S. Army failed to retake Seattle from the Soviet Union before the arrival of the PLA naval forces. In the 2007 film Aliens vs. Predator: Requiem, a B83 bomb is used to destroy a city that's infested with aliens. In the Charles Stross alternate-history novel The Revolution Trade, a version of the post-9/11 U.S. carpet bombs a trans-dimensional enemy state using hundreds of B83s. ^ Blaney, Betsy (26 October 2011). "End of an Era: Last of Big Atomic Bombs dismantled". San Francisco Chronicle. ^ a b Sublette, Carey. "Nuclear Weapons Archive - B83". Retrieved 23 December 2013. ^ Biggest US nuclear bomb dismantled in Texas. The Guardian. 25 October 2011. Wikimedia Commons has media related to B83 nuclear bomb. This page was last edited on 26 January 2019, at 03:02 (UTC).